During a show on Czech TV called “Historical sites for sale”, Zámek Nemilkov was featured in one episode! This particular episode ends with the words: “the chateau is small, suited for one family at most.” Our experience is quite different. Due to the expansive space, we were constantly looking for one another during the first visit to the chateau. We were running from one room to the other, unsure which door to use. There was dirt and junk in every corner! It was clear to us that before starting any renovations we would have to clean everything very well. Because we were worried that something could get damaged or lost during the clean-up, only our family took part. What chaos! We were constantly searching for something, especially our work tools, which (of course! ), we were missing many crucial ones. We found unique tools from the Communist era, which we were happy about at first, but they quickly proved to be more burdensome than helpful. Therefore, we made constant trips to the nearby town of Sušice to buy new brooms, pickaxes and longer and longer (and longer) extension cables. Also, none of the tools or materials had a proper storage location, and if by some chance they did, everyone had a different name for that place. This led us to create common terminology – “fireplace room”, “sweet shop”, “coffee place”, “black kitchen” etc. Since then, the effectiveness of our work increased slightly. Keep doing whatever you are doing. If you are on a mission, do not look around or let your eyes wander, especially not for some other job. Otherwise, you will never finish your original mission. Do not react to calls for help. Focus on what you are doing. Everyone must figure out a solution on their own. Never go anywhere with empty hands. It is better to move old tools to the future “communism folk museum” because with a rusted hoe you cannot even plant a tulip. When the sun sets, finish what you are working on and clean up everything after yourself, otherwise you will trip over something later. Always keep a flashlight by the main entrance, because even when a little light remains outside, it is already pitch black inside the chateau. However, the exception makes the rule, as the following story suggests. 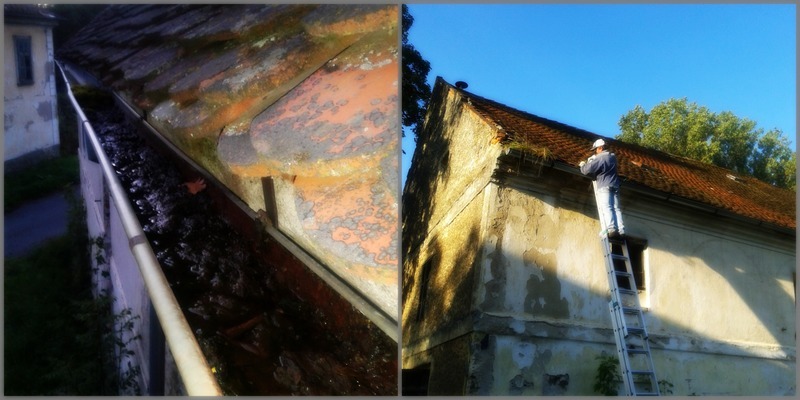 I decided to fix a hole in the roof above Baroque granary. Markéta was telling me to wait and call a roofer instead. Ignoring her suggestions, I pulled the ladder to the highest level and climbed up to the roof. During the climb, I discovered the gutters around the roof were completely clogged (if you can call rusted pieces of metal ‘a gutter’). However, if I were to clean them, I would need a small dustpan. I called for help, but without success. 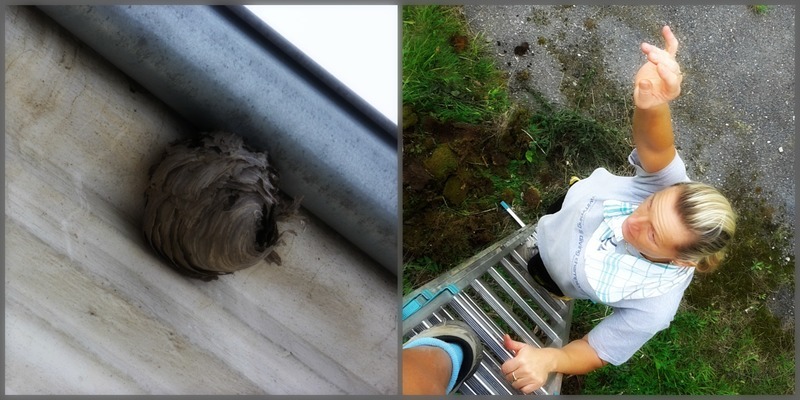 However, my calls were answered by a colony of wasps from a nest attached to the roof. Then, I was really screaming: “Heeelppp, wasps!” At this point, Markéta finally paused her mission and ran over with bug spray. Needless to say, we were not bored until dusk.